Four special telescopes to fire laser beams high into the atmosphere to create artificial stars have been delivered to ESO. 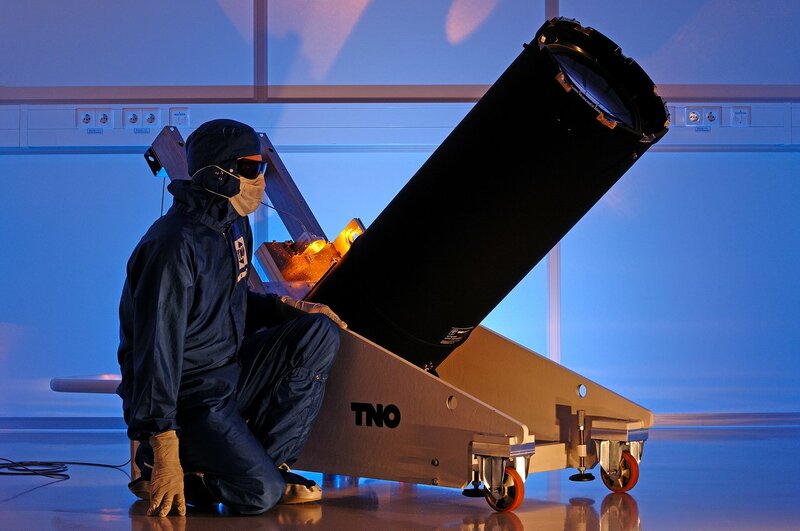 These are vital components of the Four Laser Guide Star Facility (4LGSF) for ESO’s Very Large Telescope (VLT) that were developed by the Netherlands Organisation for Applied Scientific Research (TNO). The 4LGSF is part of a next-generation adaptive optics system, the Adaptive Optics Facility (AOF), that will make the VLT’s 4th Unit Telescope Yepun a fully adaptive telescope in 2013. Composed of four powerful 20-watt lasers, the 4LGSF will help the VLT correct the image distortion caused by turbulence in the air. Telescopes usually collect light coming from the sky and focus it into an instrument. However, the new components send light in the opposite direction. These “launchers”, are used to project the lasers into the sky to create brilliant points of light. The laser beams excite a layer of sodium atoms at an altitude of 90 kilometres in the atmosphere and make them glow. These glowing spots act as an artificial guide star which can be positioned at will in the sky, so astronomers are not restricted to observations close to a sufficiently bright natural guide star. With four such artificial stars, the 4LGSF will be able to dramatically improve sharpness  across the wide field of the VLT’s near-infrared camera HAWK-I. Single laser systems, although providing excellent image quality, are restricted to much smaller fields of view. The technology will also serve as a testbed ahead of the construction of the future European Extremely Large Telescope, which will also have multiple laser guide star units. Adaptive optics systems rapidly adjust a deformable mirror to counteract the distorting effect of atmospheric turbulence — the same effect that makes stars twinkle — in real time. To do this, they use a guide star as a reference, since the star should appear as a sharp point when the effect of the atmosphere is removed. This lets the telescope make images almost as sharp as if it were in space. ESO has led the way in adaptive optics systems, having used them for over 20 years on its telescopes. The first such system on the VLT was installed just over ten years ago. In early 2006, the technology was improved with the first use of a laser guide star at the VLT.